Bet that got your attention. Bad, bad Kathleen, especially since this isn’t going to be true Pasta all Puttanesca. I’ve had the real thing many times, and it’s great. But I didn’t have a recipe on hand the first time I wanted to make it, so I made it up as I went along. Turns out I liked my version better than actual Puttanesca. Blame it on bacon. Or blame it on me because I just love pork bellies too much. Anchovies (the ingredient in true Puttanesca that I’ve replaced) are great too, but bacon is better. Like Spaghetti all Carbonara, I love this pasta because I almost always have the ingredients on hand. It’s also quick. Since I don’t add much of the liquid from the tomato can, I can whip up this sauce in the time it takes to boil water and cook a pound of penne rigate. For a vegetarian version, you can omit the bacon completely. Won’t be as tasty, but it ought to be perfectly edible. Side note: Ever heard of Bacon Marmalade? Me neither before last week. A friend in New York sent me a YouTube link to this young chef who overcooked some bacon and ended up creating Bacon Marmalade. The stuff sounds fantastic — in fact, two jars are on their way. I’m already imagining all the ways I’m going to love it — starting with right off the spoon. Next I might try it with goat cheese on puff pastry appetizers. Bet it’s crazy good with grilled tomatoes on bruschette. Ever had one of those bacon chocolate bars? Out of this world. I’ll definitely be experimenting. Can’t wait, can’t wait, can’t wait. Promise to tell you all about it. 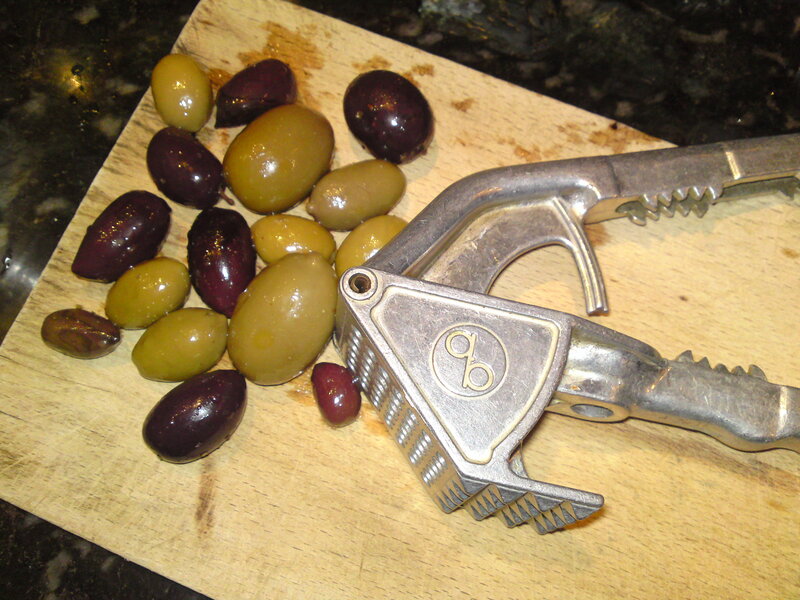 2 dozen imported olives – just about any strong flavored olives will work, as long as you like them. I prefer a colorful mix. Start your water boiling in your pasta pot. 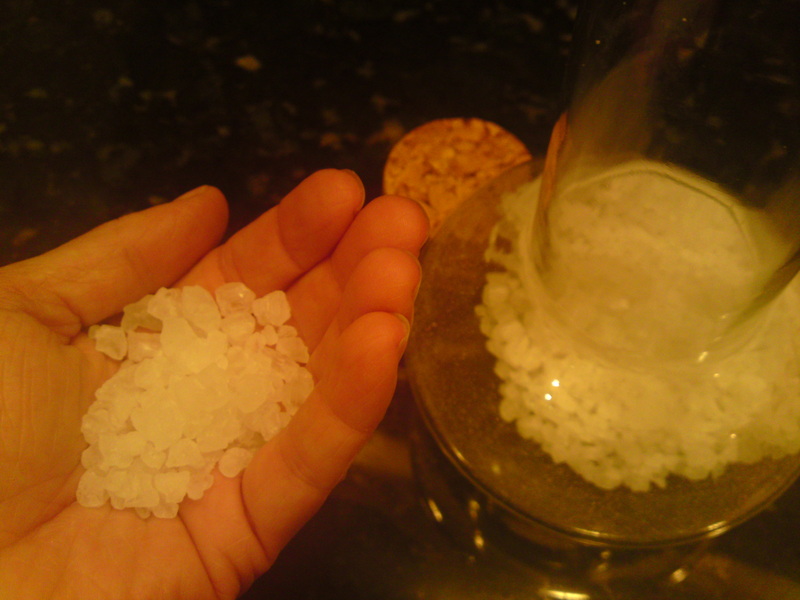 Add a small handful of rock salt. As I’ve mentioned before, the salt in your pasta is what brings your dish to life, so don’t skimp. Remember that you’ll only be eating the small amount of salt that’s in the water your pasta is absorbing. Still hesitating? Okay, think of it this way: without salt, pasta is basically hardened paper mache goop. Stack the bacon and slice into 1/2-inch wide strips. Saute on low to melt the bulk of the lard. Do not crisp. Do not worry if it does not look completely cooked — you’ll be finishing it off in the sauce. If you’re using fresh tomatoes, clean, quarter, and squeeze them over the sink to remove most of the soft center pulp and seeds. If it bothers you to find tomato skin in your pasta bowl, blanch them first to remove the skins. If you’re using canned tomatoes, pull them out of the can with a slotted spoon, quarter, and let them drain for a few minutes in a colander. Save the pulpy liquid in the bottom of the can for now–you may need it. Once the tomatoes have drained, add them to the olive oil and garlic and cook over medium heat. You’re shooting for a pleasant bubble, not a rapid boil. 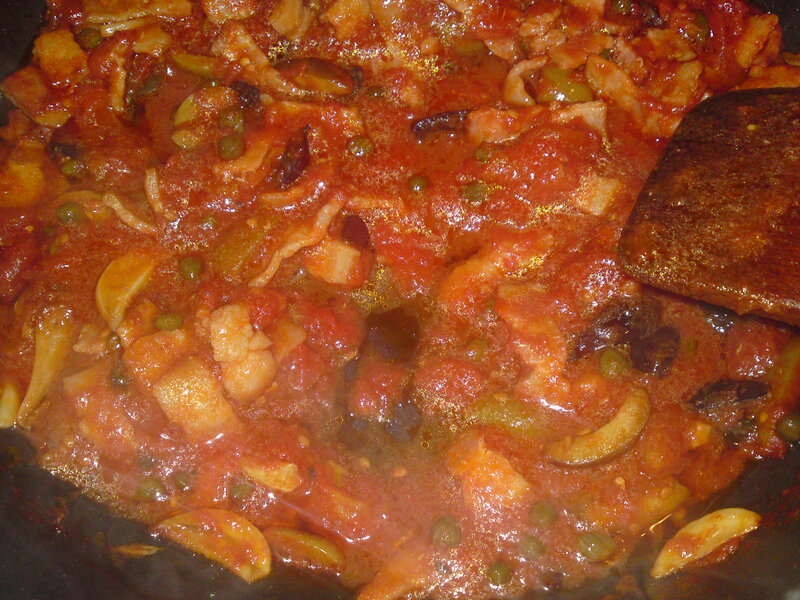 While the tomatoes are cooking, pit your olives, quarter, and add to the sauce. Add the capers as well, being careful not to add any of the vinegary liquid they’re usually packed in. While the bacon is still warm, remove it from its oil with a slotted spoon and add it to the cooking sauce. Leave the bulk of the grease in the pan, but do not fret if a spoonful or two gets into your sauce. It will only add to the flavor. Cook your sauce on medium. If you haven’t added too much of the tomato liquid, it shouldn’t take more than 15 minutes to cook, so wait a few minutes and toss your penne into the boiling pasta water. If you’ve used fresh tomatoes and don’t know just how much water they’ll produce in the pan, let the sauce get well on its way before tossing your pasta in the water as the last thing you want is pasta sitting in a colander, turning to glue as you wait for your sauce to finish cooking. As it’s cooking, break the tomato quarters into smaller chunks. I like small pieces of tomato in my sauces, so I never puree my tomatoes. You can, and should, prepare them the way your prefer. 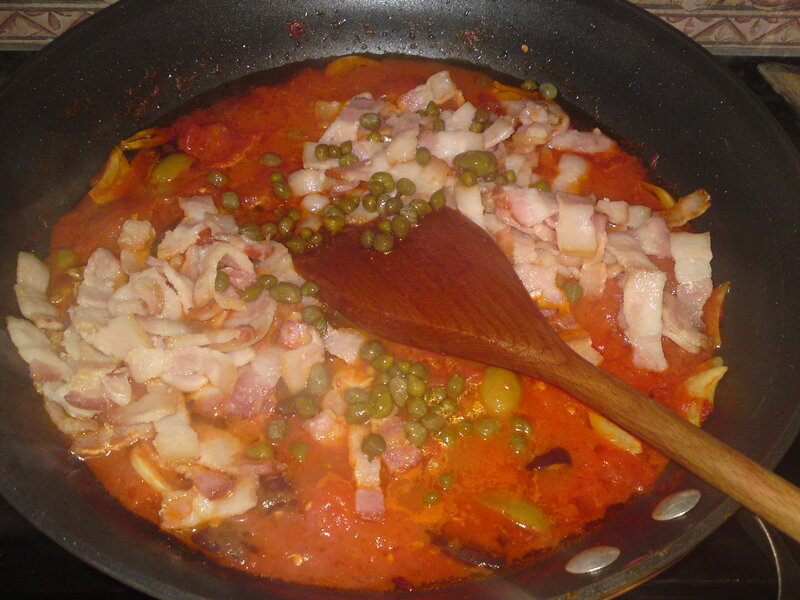 Your sauce is done when the tomatoes lose their pink color and the olive oil starts to pool. Never let your tomato sauce cook so long that it turns as thick and darkly hued as ketchup. (The sauce is just a couple minutes away from ready in the photo below.) If your sauce looks too dry, add some of the pulpy liquid from the tomato can, just a spoonful or two at a time, until the sauce looks right. 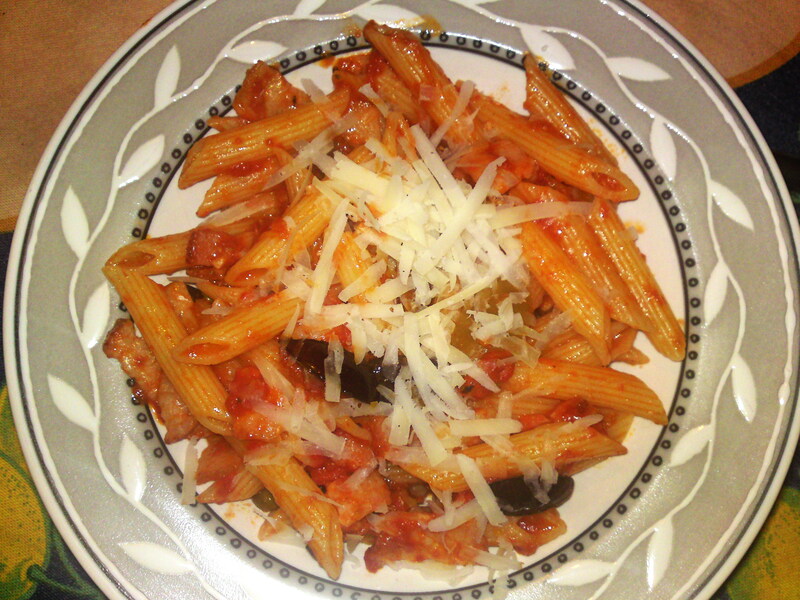 When the penne are al dente, strain well and toss with the sauce. Serve with freshly grated pecorino; some good, crusty bread; and nice bottle of red. As a fellow bacon lover, I wanted to share that Daniel and I are about to enjoy our fist meal using some of the meat form one half pig we purchased from a Skagit Valley farmer, about an hour North of Seattle. Can’t wait to taste the difference from factory pork. Also, there is a street vendor in Seattle called “Skillet” that uses Bacon Jam on their burgers. I believe they sell the stuff too. Thanks for sharing,Amanda. I’d love to hear how the farm-raised pork is. I’ve been experimenting with brining different meats, and pork is my favorite so far. About to barbecue some for tonight, in fact. I’ll check out Skillet Street Food. Haven’t tried the Bacon Marmalade yet, but it might be fun to compare the two — and then try making some!